MethodThis bridge will require substantial ground anchors at each end. Before you start building, check to see if there are any suitable trees to act as anchors. If you do use trees, do not forget to protect them from abrasion by wrapping them in sacking.Construct 2 A frames by laying 2 x 3.6m spars alongside each other and tying a sheer lashing approx 1 1/2m from the top. Open the spars out and lash a 2m spar across the base, using square lashings.Lash light spars above the base to form a simple ladder.To protect the ropes, place some sacking in the crutch of the frame and secure it in place with sisal.Tie guy ropes to the top of the spars.To make the walkway, lay the foot rope on the ground and mark the approximate position of the A frame.Place the hand rope about 1.25m either side of the foot rope. It is a good idea to peg these ropes down to maintain the spacing during the next stage.Using the light line (6mm polypropylene is ideal) attach the middle to the foot rope with a clove hitch and the ends to the hand ropes with a round turn and two half hitches. 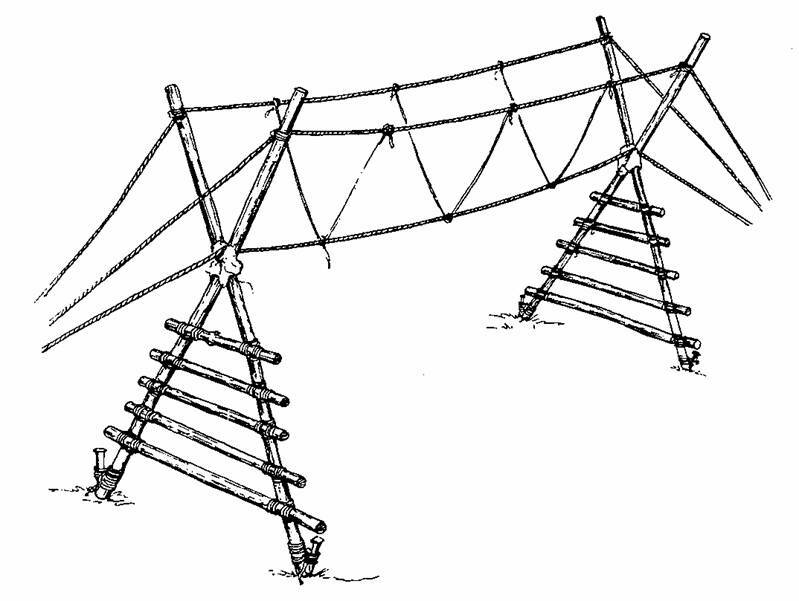 The bridge will require a vee rope every metre or so.With the A frames in position, but still on the ground, check the alignment of the bridge – the frames must be in a straight line between the ground anchors/trees.Anchor one end of the foot rope using a round turn and two half hitches and fit a Handy Billy to the other.Raise one A frame at a time and guy them when they are upright. Heel the butts into the ground to stop them sliding during use.As you tension the foot rope, use a light spar to ease it over the A frame otherwise it will lock in the crutch and tend to pull the frame over. Make the other end of the rope off and remove the Handy Billy.The bridge should now be strong enough to allow the A frames to be climbed. Attach the hand ropes to the top of the spars using a loose square lashing. Tension them off using the Handy Billy and then tighten the lashings with a couple of frapping turns.NoteThe tension in the hand ropes must be the same. This can be achieved either by using a very long rope doubled back on itself or by looping the two ropes together and placing a sing large pulley block in that loop. The ropes are tensioned with the Handy Billy attached to this block.